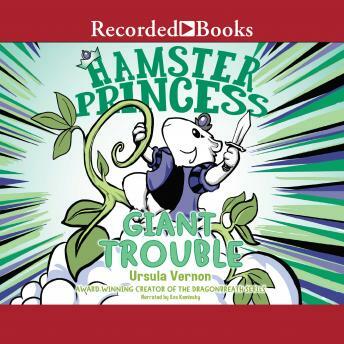 A magical beanstalk leads to a GIANT surprise in book four of Ursula Vernon's critically acclaimed Hamster Princess series. Harriet Hamsterbone doesn't go looking for trouble. Somehow it always finds her. So she isn't completely shocked when a salesman attempts to sell her some magic beans, or when one of those beans grows into a towering beanstalk leading up into the clouds. But even Harriet is surprised to find a giant castle-complete with one very poetically challenged giant-at the top of it. And she certainly never thought she would make a new friend named Strings who is half harp, half hamster. But Strings isn't the giant's guest-she and a rather large goose are his prisoners! This calls for a heroic rescue, and Harriet is just the hamster for the job.